Intertops Poker and Juicy Stakes Casino Host $2000 Slots Tournament Featuring Betsoft Slots. 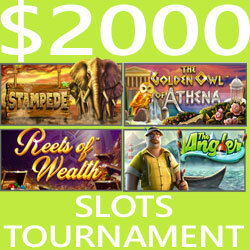 From February 1st - 8th Intertops Poker and Juicy Stakes Casino's are hosting the $2000 Slots Tournament. The tournament will feature four of the most-played slots from Betsoft: Stampede, The Golden Owl of Athena, The Angler and Reels of Wealth. The week-long tournament awards $2000 in prizes with a first prize of $400. "A few players are going to get some nice bonuses after playing these games all week, that's for sure," smiled Juicy Stakes' manager. "First prize is $400!" Until last year, Intertops Poker and Juicy Stakes Casino were known primarily for their active poker rooms on the Horizon Poker Network. Thanks to dozens of new games and weekly bonus promotions, their casino sections (featuring games from Betsoft, Lucktap and WorldMatch) have also become popular all over the world. Reels of Wealth is built on a "Rolling Wins" platform that awards a re-spin with up to 3X win multiplier after every winning spin. Stampede takes you to the African Savannah where majestic elephant herds rule supreme. This beautifully illustrated game pays out for all combinations no matter where they are, giving 1024 ways to win. Scatters trigger up to 20 free spins where Wilds can multiply wins up to 3X. The Angler, featuring burly fisherman Otis, features Oyster Free Spins and Clingy Wilds, a frequently occurring Wild symbol and an innovative "Time to Fish!" bonus game. In the epic Golden Owl of Athena game, you will journey to ancient Greece in search of great rewards. The Golden Owl is the key to unlocking Free Spins. Three trigger up to 20 free spins with one Special Symbol, anointed by Athena, that expands to fill the reel and award bonus wins.